Jeffrey A. Nigro (email: jeffnigro@mac.com), adjunct lecturer at the Art Institute of Chicago and instructor at the Newberry Library, currently serves as Regional Coordinator of JASNA–GCR. William A. Phillips (email: waphil3@gmail.com), a frequent AGM presenter, is currently Deputy Regional Coordinator of the Greater Chicago Region. William was co-coordinator of the 2008 AGM. jane Austen lived in revolutionary times. In Europe and North America, the geopolitical world in which we still live was beginning to take shape. The American and French Revolutions expanded patterns of what was becoming the modern nation state. By the end of Austen’s life, the ancient definition of society as anchored in land ownership and aristocratic origins was showing signs of yielding to a society based on individual enterprise and personal merit. after a minature by John Cooke. The purpose of this article is to shed some light on yet another “revolution” that was definitely a part of Austen’s world—a revolution in masculine style. While this revolution may not have had the momentous, global effects of such other matters of historical record as the American and French Revolutions, its effects have endured for the two centuries since Austen lived. 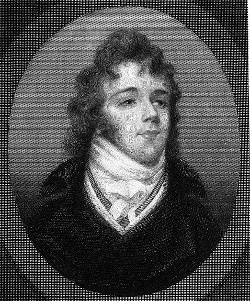 At the core of this “revolution” (at least in England) were the innovations in dress and lifestyle promoted by Austen’s contemporary George Bryan “Beau” Brummell (1778-1840).1 Brummell was the seminal intellectual figure in this revolution and its leading proponent in both wit and wardrobe. Austen devotees will note that Brummell lived almost twenty-three years longer than she did, but their lives in England cover the same time period. Brummell was born just two and a half years after Austen, but he left England fourteen months prior to her death. He fled to France on May 18, 1816, primarily to escape debt but already experiencing the effects of the syphilis that would kill him. He died in an asylum at Caen, destitute and demented, on March 30, 1840. The England into which Austen and Brummell were born was on the verge of a change to simplicity and comfort in masculine style. The discussion here first takes a brief look at the styles that held sway in Britain and continental Europe as Austen and Brummell arrived on the scene. Next, there is a discussion of Brummell’s life, his persona as a self-created “dandy,” and the innovations in sartorial style that helped define that persona. A third section examines Austen and Brummell together, arguing that Austen devotees find both Brummell-like figures and their contraries in her writing. At the time of Austen’s birth in 1775, it was still acceptable for men to wear silk, satin, or velvet in bright or pastel colors, with lace cravats and cuffs, powdered hair and perfume. The most extreme “fashion victims” of the moment were the Macaronis. 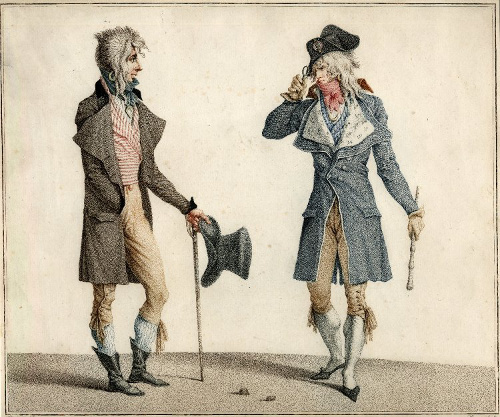 These foppish men supposedly derived their name from the Macaroni Club, an organization of fashionable young Englishmen who had returned from the Grand Tour with a love for continental fashions, culture, and cuisine (Nigro 51-52). The Macaroni style was an extreme form of appearance, exaggerated in costumes, cosmetics, and hairstyles. The Macaroni, a real character at the late masquerade, by Philip Dawe (1773). This style was highly controversial and much ridiculed at the time. It marked the end of a long tradition of flamboyant male fashion, with the colorful garb of Count Alfred d’Orsay providing a belated coda in the 1830s. By the period of Austen’s literary maturity in the 1810s, men’s fashions had changed dramatically. The eighteenth-century fop was replaced by a new type, the dandy. According to the Oxford English Dictionary, the use of the word “dandy” to describe a man “who studies above everything to dress elegantly and fashionably” first dates from about 1780 when concepts of male and female elegance began to diverge. The psychologist J. C. Flügel would famously dub this process “The Great Masculine Renunciation” (110). Beau Brummell represents the zenith of this phenomenon, but not its origins. A gradual process of simplification in male attire began in the 1780s, and was particularly associated with the British aristocracy and gentry, who were thought to embody the ideal of plainspoken country virtue as opposed to urban corruption. Woolen broadcloth began to replace silk; gold and silver embroidery gradually disappeared from male attire; and hair powder became increasingly less fashionable, for political, social, and aesthetic reasons. Further significant influences on subsequent male fashion were the French dandies of the period immediately following the French Revolution and the Reign of Terror: the Muscadins and Incroyables (Incredibles).2 These members of the jeunesse dorée (gilded youth) employed flamboyant fashions: high-tied cravats, wide lapels, and the frock coats often associated with the pre-Revolutionary aristocracy (Ribeiro 95). Les Incroyables, by Louis Darcis after Carle Vernet (1796). British Museum, London. At the time, commentators often assumed that these fashion choices were reflective of right-wing, counterrevolutionary sentiments. More recent analyses (e.g., Wrigley and Amann) have demonstrated that these fashions were far less politically legible than they were often assumed to be. Amann notes that the Incroyables in particular took an ironic attitude toward fashion choices; they liked to sport with public expectations that certain clothing elements had political ramifications, while simultaneously asserting that the meaning of these elements was solely aesthetic (106). Men’s fashion in Britain experienced a similarly momentous shift at the same time. Among the French émigrés were tailors, who brought Muscadin and Incroyable styles to London at the very moment that the British capital was becoming the richest and most cosmopolitan city in Europe (Kelly 113). A 1795 tax on hair powder levied by Prime Minister William Pitt created a situation in which the decision “to powder or not to powder” had complex political ramifications. The rebellious “Crops,” who wore their hair short and unpowdered, included some of the most elegant and politically prominent leaders of the anti-Pitt opposition (Amann 169-70). At this same moment George Brummell moved to London and became an intimate friend of the Prince of Wales. Beau Brummell’s personality can be elusive, mostly because he was determined that it should be. A paradigmatic example of the modern or postmodern concept of “self-fashioning,” the Brummell style comprises two components that often merge: a “look” and a persona. Like Jane Austen, Brummell was a brilliant creator of character, although in contrast to Austen’s gallery of memorable characters, Brummell’s most polished creation was his own persona, a collection of attitudes, quips, and judgments on the dress of others, as well as fashion choices. Brummell’s self-fashioning begins with his biography. Son of the former secretary to the Prime Minister Lord North, Brummell grew up both in a luxurious “grace and favour” apartment at Hampton Court Palace and at Donington Grove, the elegant Gothic Revival country house that his father had purchased in Berkshire (Kelly 26-28). Like his older brother, he was educated at Eton. After a brief stint at Oxford, Brummell moved to London, where he became a member of the elite Tenth Hussars, under the command of the Prince of Wales himself. Brummell’s wit, charm, and sartorial style captivated the prince and his intimates. Using the royal friendship to ingratiate himself with the leaders of the ton, Brummell became the arbiter of elegance in London society. Once in this lofty position, his ingratiating qualities were overtaken by a combination of arrogance and world-weary cynicism. Accounts vary, but most versions blame Brummell’s overreaching insolence for his eventual falling-out with the prince. Despite this clearly privileged background, it pleased Brummell to pretend that his origins were more obscure than they really were. He promoted this fantasy in order to construct a carefully crafted myth of himself as his own creation, a man from nowhere who suddenly emerged as the leader of high society. Many people bought into this myth: Catherine Gore, whose “silver fork novels” satirizing Regency “high life” often include characters based on Brummell, describes a dandy as “a nobody, who made himself somebody, and gave the law to everybody” (qtd. in Moers 26). Over the course of the nineteenth century, the Brummell legend grew. “The Beau” became a civilian version of Napoleon crossed with a Romantic genius, for whom dandyism was a kind of spiritual calling. Jules Barbey d’Aurevilly’s 1845 essay “Du Dandysme et de George Brummell” presents the apotheosis of the Brummell myth by taking the self-contained image that Brummell projected as a sign of his ability to rise above ordinary human emotions and sensations. More recently, Ian Kelly’s scrupulous research has uncovered previously unknown aspects of Brummell’s life, the most sensational discovery being that Brummell suffered from syphilis (192-93). As Kelly’s work reveals, this diagnosis not only explains much of the erratic behavior that characterized Brummell’s sad later years, but it also reveals that he really was human after all. More relevant to the topic at hand, Kelly clarifies some of the influences on Brummell’s mature fashion style and elaborates on Brummell’s process of creating his persona. As can be seen from the sometimes outlandishly decorated male garments that led into the era of Austen’s life, men’s fashions had very little to do with the male form. For the two centuries before Austen, elite male fashion primarily served to display wealth and position by employing such materials as imported silks and dyes, covering up bad physical health practices with such garments as voluminous cloaks and widely skirted coats, and masking bad personal hygiene with such products as powder and perfume. Brummell developed his sartorial style from a variety of sources and influences. Ian Kelly identifies one early source as the uniform worn by most of the students during the arcane Etonian ritual called Montem: “a dark blue jacket with two rows of brass buttons, allowing a view of a white stock at the neck and paired with paler breeches” (39). A combination of blue coat and buff breeches had already acquired political associations with the Whig party, as well as being the attire of Goethe’s fictional Werther and his real-life imitators. From the post-Revolutionary Muscadins, Brummell adopted high-tied cravats and an emphasis on cut rather than decoration. From the Incroyables, he appropriated quizzing glasses—single magnifying lenses with handles, useful for observing and passing judgment—and an ironic stance toward social interaction. Brummell’s disdain for hair powder was influenced by the “Crops,” the young English fashionables who adopted shorter, unpowdered hair in the wake of the 1795 tax on powder (Amann 179-80). Brummell’s achievement involved the combination of these influences into a unified aesthetic, emphasizing the body in a manner comparable to contemporary feminine fashions (Nigro 59). Added to this was the creation of a persona, in which the understated elegance of the dandy’s appearance is complemented by an emphasis on dry wit and superior bearing. This elegant simplicity and cleanliness would have stood out amid any vestiges of color and luxury that still clung to the male wardrobe. The Brummell style could thus be described oxymoronically as ostentatious understatement. Brummell was aware of the dandy’s desire to be noticed without drawing attention to himself. He is supposed to have said, “If John Bull [i.e., the bluff, average British male] turns around to look at you, you are not well dressed; but either too stiff, too tight, or too fashionable” (Kelly 5). The Brummell color palette was radically different from the rainbow of hues previously available to the fashionable male, although Brummell preferred the Montem-inspired blue-and-buff combination to the stark black-and-white that would become standard evening dress a few years later (Moers 82). For Brummell and his imitators, the blue coat was suitable for all occasions, whether daytime or evening, and it became the most ubiquitous element of the Brummell-style wardrobe. 3. Bathe in hot water. Brummell’s contemporaries believed that hot water was unhealthy while cool or cold water did more good for the body. The belief in cold water explains why Persuasion’s cranky Mary Musgrove was happy to have gone sea-bathing in November. The ambivalent attitude of a dandy wanting to be noticed without being noticed is inseparable from Brummell’s detached view of social relations. Brummell’s high-tied cravats made it easier for him literally to “look down on” people. While the French Incroyables had originated the “quizzing glass” in pretended myopia in order to avoid military service (Gendron 181), this device also enabled them to gaze judgmentally at others. Brummell adopted this latter use of the quizzing glass to enhance his ability to give people a haughty once-over as he passed judgment on their appearance or manner. Brummell’s witticisms, pronouncements, and putdowns were closely connected to his detached and ironic sense of self. These numerous (and possibly apocryphal) statements continue both to amuse and unsettle. He allegedly deflated a Duke’s pride in his attire with, “Do you call that thing a coat?” (Moers 20). He claimed to have broken off a romantic entanglement with a woman when he found out that she ate cabbage (Kelly 198). A visitor who found Brummell with a foot injury was told, “I am very sorry for it, too, particularly as it’s my favourite leg!” (Sima 21). The ultimate irony is that Brummell seems to have been aware of the inexplicability of his own celebrity, telling Lady Hester Stanhope, “If the world is so silly as to admire my own absurdities, you and I may know better, but what does that signify?” (Kelly 3). Such ironic statements enable the dandy to be part of the exclusive society that is his only possible habitat while simultaneously mocking its follies (Godfrey 25). We have located no evidence that Jane Austen mentions Beau Brummell. Nevertheless, given an assumption of familiarity with the styles of the day on the part of Austen, her circle, and her original readers, it seems reasonable to ask how Brummell and the Brummell style and persona might be seen to interact with Austen’s characters. The earliest surviving piece of Austen’s juvenilia certainly suggests that she understood the generational, sartorial shift brought about by Brummell and the fashionable men he influenced. In “Frederic and Elfrida,” a young woman receives two consecutive marriage proposals: the first from an elderly man with a sallow complexion and an old pink coat; the second from a handsome young gentleman in a blue coat (Minor Works 8).3 The change from eighteenth-century fop to nineteenth-century dandy could hardly be expressed more succinctly. The dramatic changes in male attire during Austen’s lifetime came primarily from the availability of quality English-sourced materials and rather rapid, quite drastic changes in tailoring techniques. In the London scene, these changes had a lot to do with the classically inspired style and prodigious promotional skills of Beau Brummell, which served to spread masculine fashion beyond the aristocracy. He became a connoisseur of fabric and participated with his tailors not only in the design of garments but also in their popularization, particularly when his name was attached to the “word of mouth” he helped to generate (Kelly 111-12). Despite Austen’s lack of fashion detail, readers can assume that most of her featured males dress somewhat similarly, given Brummell’s influence.5 More important, Austen gives to these male characters personality traits that fall within a Brummell-like spectrum. Like Brummell, at least in his early days, these men wish to ingratiate themselves with “particular” social groups at least partly to make it clear that they belong and arguably to demonstrate their superiority within those groups. It doesn’t seem to matter whether they have sufficient means; they all want to ingratiate themselves. In Mansfield Park Henry Crawford employs his wealth and charm in order to ingratiate himself with the Bertram family, skillfully disguising his lack of moral character. When the reader of Persuasion first encounters William Elliot, he already has the money he needs due to his marriage but is on a mission to insinuate (or re-insinuate) himself into the Elliot family to solidify his succession to the baronetcy. Perhaps the greatest example of this tendency is Frank Churchill in Emma. In a revealing scene, Churchill, accompanied by Emma and Mrs. Weston, shops for gloves at Ford’s. His acceptability as a citizen of Highbury is more important than which pair of gloves he decides to buy (E 199-200). It is perhaps significant that he does not single out any of them as unacceptable although he almost certainly has plenty of resources for sartorial purposes. These three men display sufficiently excellent manners and also exploit their resources in order to ingratiate themselves with people from whom they have something to gain. On the other side of this spectrum are two characters who are in search of financial security in order to fund their extravagant lifestyles, John Willoughby in Sense and Sensibility and George Wickham in Pride and Prejudice. These two men are as ingratiating as the previous three and as invested in marshalling their charms for devious purposes. They are also both beneficiaries of one feature of the Brummell revolution. Under Brummell’s influence, the plainness of the highest fashion meant that it was available to men outside the uppermost levels of society. An observer would require specialized skills in order to “read” wealth or social status through appearance. Willoughby, Wickham, Crawford, Churchill, and Elliot enter their respective novels as “ingratiating” types. It would appear that for this characteristic to bear fruit, the purveyor must also possess wealth and be able to hold on to it. Brummell’s ingratiating qualities worked in his favor at first, but he ended in debt and disgrace. In pursuit of financial security, Willoughby achieves considerable affluence. Wickham does not. On the surface, Robert Ferrars in Sense and Sensibility seems something like a Brummell type. His vanity and unwarranted sense of superiority are Brummell-like, just as his self-reported cavalier treatment of Lord Courtland and Lady Elliott displays an arrogant tendency to order the aristocracy around (251-52). It is not clear, however, that Robert is aware of his own shallowness; unlike Brummell, he is largely oblivious to the effect he has on others. The reader and the Dashwood sisters first encounter Robert selecting a toothpick case at Gray’s,6 where Elinor notes a contrast between “his own inventive fancy” and “a person and face, of strong, natural, sterling insignificance, though adorned in the first style of fashion” (220-21). Robert’s “insignificance” implies that he is as uselessly ornamental as Brummell, but there is a difference. As Brummell’s statement to Lady Hester Stanhope reveals, he knew that people were foolish to follow his lead in concentrating on surface fripperies whereas Robert is oblivious to his own shallowness. As D. A. Miller puts it, “Unlike insignificance, which denotes a condition, style presupposes a deliberately embraced project. Insignificance might only befall one, whereas style . . . one must choose, pursue, perform” (17). Brummell is known to have worked with his vendors to create and then popularize styles and designs. Robert Ferrars, like Sir Walter Elliot, cares about no one but himself. Even though Austen says almost nothing about how her male characters are dressed, Darcy can be seen as a Brummell-like character while Sir Walter Elliot reflects the pre-Brummell era. Their respective novels show us a Darcy who is more interested in impeccability than display and a Sir Walter who is all about display, about being noticed as the most outstanding version of “maleness” available. [He] looked at her only to criticise. (23). While Brummell began his career in London society by ingratiating himself with its grandest denizens but ends up alienating them, Darcy begins by believing he has the right to antagonize his “social inferiors” but ends up realizing that he has much to learn from them. Both Brummell and Darcy seem to understand the discrepancy between style (manners) and substance (integrity), although Brummell delights in playing with those concepts, while Darcy does not. Pride and Prejudice is, as Tony Tanner argues, a novel in which “the problematical discrepancies between appearance and reality” (114) are of central importance. Drawing upon Erving Goffman’s concept of “role distance,” Tanner notes that Darcy is a character “at all times quite aware that the particular role [he is] performing in any one particular situation is not to be identified as [his] self” (123). “His hauteur,” says Tanner, “makes him go in for a certain amount of ‘role distance,’ . . . but, unlike Wickham [and, one might add, unlike Brummell] he is not cynical about role-playing, and by the end his performing self is shown to be in harmony with his reflecting self” (124). Darcy is Brummell-like in his very sense of individuality. Amann argues that the dandy types of the period of the French Revolution and its immediate aftermath—for example, the Muscadins, Incroyables, and Crops—were primarily just that: types, stereotypes, even caricatures. Like the Macaronis before them, these dandy figures were usually imagined as a group, as types rather than individuals. As in many other ways, Brummell represents something new: a dandy as an individual, a personality that, however self-consciously cultivated and theatricalized, was the hallmark of a unique individual celebrity. Earlier dandies had been, to a great extent, defined by their critics, through political speeches and pamphlets, satires, and cartoons. Brummell created his own persona. Darcy may not share Brummell’s playful ambiguity about style and substance, but like Brummell, Darcy refuses to let others define him. Darcy clearly takes his social responsibilities seriously, but he shares Brummell’s detachment from the banalities of social life. His reluctance to dance is partly a reluctance to engage in idle chitchat, partly an unwillingness to become part of the crowd. Unlike Brummell, however, Darcy will let personal feelings intrude. He will dance if it means dancing with Elizabeth, with whom he is falling in love, almost against his will, as he later confesses in the first proposal scene (189). Darcy seems aware of the ambivalence Brummell himself felt about the paradox of standing out from the crowd through understatement. Therein lies the challenge, not so much for men who choose the Brummell style, but for the people surrounding them. When most men of means start to dress quite similarly, individuals cannot be easily judged by appearances. As the incident of the Bennet sisters’ first glimpse of Bingley reveals, Austen knows that there can be something comical about this situation, but she also understands its serious implications. Charlotte in “Frederic and Elfrida,” though noting generational differences and dissimilar personality traits of two suitors based on their clothing choices, may accept both proposals due to her ingrained desire to please. By the time Pride and Prejudice was published, Elizabeth Bennet and her neighbors, confronted with the three gentlemen of Netherfield, must read their characters without reference to their fashion choices. Although Mr. Bingley is “amiable” (11) but not “‘intricate’” (42), Mr. Hurst “merely look[s] the gentleman” (10), and Mr. Darcy is complex and opaque, it is safe to assume that they all dress in a similar fashion. Austen’s narrator says almost nothing about their physical appearance or sartorial choices, so it is through conversation and observation that their personalities become distinct. The years 1814-15, the time at which Austen set Persuasion, her final novel, saw the pinnacle of Brummell’s influence on the male image cultivated among those who aspired to be identified with the London ton. Would the narcissistic Sir Walter Elliot be a devotee of the Brummell style? Definitely not. Admiral Croft’s characterization of Sir Walter as “‘rather a dressy man for his time of life’” (128) seems to indicate that Sir Walter has clung to rather “foppish” ways. Sir Walter would be perplexed by Brummell’s attempt to downplay his lineage. More important, the attitudes of “less is more” and “standing out by not standing out” simply do not apply to Sir Walter: “Vanity was the beginning and the end of Sir Walter Elliot’s character” (4). His use and recommendation of Gowland’s lotion (145-46) emphasizes the high value he places on physical perfection, even as it contradicts Brummell’s moves to eschew such artificial aids to that perceived perfection. Sir Walter notices others only for the purpose of complimenting himself by comparison or eliciting a compliment, as in his invitation couched in the form of praise for Colonel Wallis, which results in the commendation “Modest Sir Walter” (142). So far is he from being perceived as a person of wit that Admiral Croft observes, “‘The baronet will never set the Thames on fire, but there seems no harm in him’” (32). Portraying Sir Walter as a pre-Brummell fop only serves to reinforce his status as a social dinosaur in a changing world. Beau Brummell Statue, by Irena Sedlecka (2002). Despite widely different personalities and goals, Jane Austen and Beau Brummell continue to exercise profound influence on the way people think and live. Austen and Brummell share a sense of social detachment and were both keen observers of their societies. It might be tempting to arrive at the simplistic conclusion that Brummell gave us “style” and Austen continues to give us “substance,” but the situation is more complex than that. Thanks to Brummell, a classically tailored three-piece suit is still the embodiment of elegance, now for women as well as men. 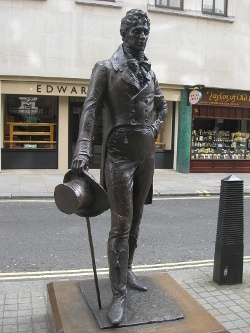 Brummell presides over the high-end shopping district of London in the form of a statue dedicated in 2002. On a less superficial level, he also helped to create the modern concept of individuality and (for better or worse) celebrity. Austen employs a dazzling literary style that is enjoyed as an end in itself. More profoundly, as Austen readers know, her genius continues to encourage exploration beneath the surface of social conventions to gain a greater understanding of human nature. It is these shared qualities that continue, after two centuries, to be worthy of interest and investigation in both scholarly and popular cultures. 1. Brummell was not the first fashionable male in English history to be given the appellation “Beau,” and it was not originally a positive term. The nickname had been used for, among others, Robert Fielding (1650/51-1712) and Richard Nash (1674-1761). Brummell, however, became known as “The Beau,” an indication that he was perceived even in his lifetime as the culmination of an older tradition of fops as well as the first in a new line of modern dandies. 2. The traditional explanation for the term “muscadin” was that these men wore heady amounts of musk-based perfume. If so, that would be a major difference between them and Brummell, who, as we will see, rejected the wearing of perfume. Elizabeth Amann, however, suggests that the term “muscadin” goes back much further, with a long history in the seventeenth and eighteenth centuries (23-24). 3. Austen is almost certainly referring to the color “pink” in the conventional sense of a pale red: the color of, say, a pink rose or carnation. The OED’s earliest reference to the use of “pink” to describe the scarlet color of hunting coats dates from c. 1791, and apparently the term did not gain widespread currency until well into the nineteenth century. 4. Rogers suggests that Wickham’s blue coat could be either civilian or military attire (532 n.6). Although the latter possibility cannot be ruled out, given the short turnaround time between Wickham’s leaving the militia and entering the regulars, it seems more likely that the blue coat in question is a Brummell-style civilian coat. 5. Just as Austen did not spend a lot of space in her work discussing the way her male characters dressed, Austen scholars have devoted relatively little attention to matters of male attire. One notable exception is Sarah Frantz, whose article in Persuasions 25 complements the present study. Both Frantz’s article and the present study give considerable credit to Brummell for the “Great Masculine Renunciation.” Both recognize the stormy period of Western culture during which Austen (and Brummell) lived; the changes in men’s fashion during this period create the necessity for period and modern readers to make judgments about Austen’s male characters based on behavior rather than just fashion. Frantz’s goal is to illuminate the growing romantic nature of Austen’s work and to place some of the male characters in that progression. She puts her study into the larger context of women writers creating male characters (165). The goal of the present analysis is to look more closely at the style and influence of Brummell and to examine how they might have entered Austen’s artistic awareness and hence influenced her work. 6. Gray’s shop was in Sackville Street, Mayfair, just off Piccadilly. That location is surrounded by a number of important Brummell locations: Jermyn Street and St. James Street just across Piccadilly in St. James’s, as well as Savile Street (later Savile Row), Old and New Bond Streets, York Street, and others, all on the Mayfair side of Piccadilly and all of which were the sites of various vendors used by Brummell. Gray’s was also just a few minutes’ stroll from the house Brummell acquired and renovated at 4 Chesterfield Street, several streets to the west in Mayfair. Amman, Elizabeth. 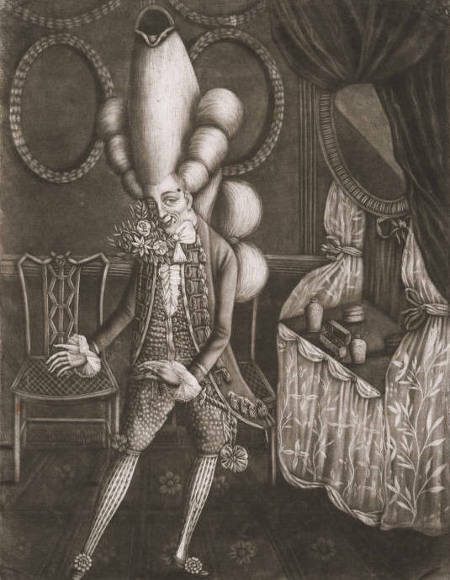 Dandyism in the Age of Revolution: The Art of the Cut. Chicago: UCP, 2015. Austen, Jane. Jane Austen’s Letters. Ed. Deirdre Le Faye. 3rd ed. New York: Oxford UP, 1995. _____. The Novels of Jane Austen. Ed. R. W. Chapman. 3rd ed. Oxford: OUP, 1933-69. Flügel, J. C. The Psychology of Clothes. 1930. New York: International Universities P, 1971. Frantz, Sarah. “Jane Austen’s Heroes and the Great Masculine Renunciation.” Persuasions 25 (2003): 165-75. Gendron, François. The Gilded Youth of Thermidor. Trans. James Cookson. Montreal: McGill Queen’s UP, 1993. Godfrey, Sima. “The Dandy as Ironic Figure.” SubStance 11.3.36 (1982): 21-33. Kelly, Ian. Beau Brummell: The Ultimate Man of Stlye. New York: Free Press, 2006. Miller, D.A. Jane Austen, or The Secret of Style. Princeton: PUP, 2003. Moers, Ellen. The Dandy: Brummell to Beerbohm. Lincoln: U of Nebraska P, 1960. Nigro, Jeffrey A. “Estimating Lace and Muslin: Dress and Fashion in Jane Austen and Her World.” Persuasions 23 (2001): 50-62. Oxford English Dictionary Online. 29 Aug. 2015. Ribeiro, Aileen. The Art of Dress: Fashion in England and France 1750 to 1820. New Haven: Yale UP, 1995. Rogers, Pat, ed. Pride and Prejudice. Cambridge: CUP, 2006. Wrigley, Richard. The Politics of Appearances: Representations of Dress in Revolutionary France. New York: Berg, 2002.